Celebrating the release of the live-action Black Panther movie with an update featuring T’Challa, his friends, and his foes I know, some have been both friend and foe, but this isn’t the time for that argument, I’ve got an update here. 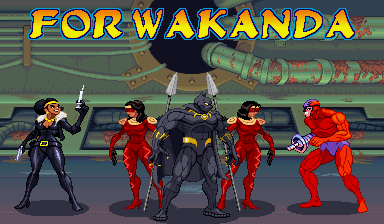 Custom Sprites: the Black Panther, the Dora Milaje, Klaw, and Nightshade were added to the Marvel gallery. T’Challa, the Dora Milaje and Nightshade have multiple sprites, so be sure to check out their mini-galleries! The new stuff has been added to the GFX Generators, where you can make your own graphics! Last, but not least, this is the short (and kinda rushed) version of an idea I’ve had for almost two decades now. One of the sprite sets I wanted to make for M.U.G.E.N. was the Black Panther and I even had an idea for a fancy intro storyboard for it. I never got around to making a whole sprite set, but the intro (and the perfect theme song to use for it) has been stuck in my head ever since. Again, this was rushed (outside issues ate up a lot of time I’d rather spend working on this), but consider this a down payment on the full version I want to make some day.